Unlike IPv4, IPsec security is mandated in the IPv6 protocol specification, allowing IPv6 packet authentication and/or payload encryption via the Extension Headers. However, IPsec is not automatically implemented, it must be configured and used with a security key exchange. The IPv6 header is not variable, as in IPv4, but has a simple, efficient fixed 40-byte length. Minimum packet size is 1280 bytes, from 40 bytes of header plus 1240 bytes of payload. The Next Header field defines the type of header immediately following the current one. It is usually the payload, but sometimes Extension Headers provide valuable functions. Encryption capabilities are defined by the Authentication and Encapsulated Security headers. 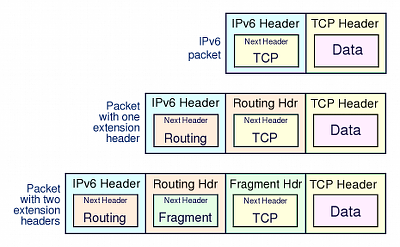 Right: A simple IPv6 packet (top row) with a TCP header and data payload. The second row shows the packet with an additional Routing header, third row has Routing and Fragment headers. IPsec defines cryptography-based security for both IPv4 and IPv6 in RFC 4301. IPsec support is an optional add-on in IPv4, but is a mandatory part of IPv6. It provides two security headers which can be used separately or together: Authentication Header (AH) and Encapsulating Security Payload (ESP), used in conjunction with security key exchange. AH provides connectionless integrity, data-origin authentication and protection against replay attacks. It authenticates with an Integrity Check Value (ICV) calculated over the payload, the header, and unchanging fields of the IPv6 header and options. AH does not provide privacy and confidentiality of packet contents. See RFC 2402. ESP also provides connectionless integrity, data-origin authentication, protection against replay attacks, limited traffic flow confidentiality, but also provides privacy and confidentiality through encryption of the payload. See RFC 2406. IPSec operates in two different modes: Transport mode (host-to-host) and Tunnel mode (gateway-to-gateway or gateway-to-host). 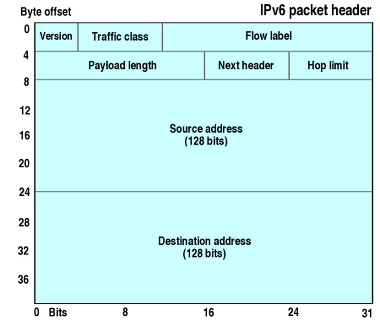 Transport mode: the IPv6 header of the original packet is used, followed by the AH or ESP header, then the payload. Tunnel mode: a new IPv6 header encapsulates the AH or ESP header and the original IP header and payload. AH authenticates the packet and the outermost IPv6 addresses (except for mutable fields), but does not encrypt payloads. AH cannot be used to traverse NATs, as it calculates the integrity check value (ICV) over source and destination addresses: NATs translate addresses, so would invalidate ICVs. ESP authentication does not include the outermost IPv6 headers, but in Tunnel mode it protects the original headers. ESP is used to build virtual private network tunnels between sites. It permits NAT traversal, as it does not use the outermost address values in the ICV calculation. If AH and ESP are used together, ESP is applied first, then AH authenticates the entire new packet. Security Association is a record of the authentication algorithm, encryption algorithm, keys, mode (transport or tunnel), sequence number, overflow flag, expiry of the SA, and anti-replay window. The SA is held in a database at each endpoint, indexed by outer destination address, IPsec protocol (AH or ESP), and Security Parameter Index value. Selection of SA can be manually (pre-shared keys) but preferably is automated with Internet Key Exchange (IKE, IKEv2). IKE uses Diffie-Hellman techniques to create a shared secret encryption key used to negotiate SA data. For key exchange, IKE depends on a Public Key Infrastructure (PKI), which is not yet widespread. The framework and syntax for key exchange is ISAKMP (Internet Security Association and Key Management Protocol). See RFC 2408.